If everything in this article at blogcritics is true (and that does appear to be the case) then there is some very bad stuff going down at All Romance E-Books. Hard to tell, from the available info, whether the root cause is malice or stupidity, but for the authors caught up in the ongoing mess, it doesn’t make a difference. A quick reminder that it’s only seven more days before the end of my traditional Midwinter Festival Sale – if you’ve got got a friend who might want a critique and line-edit, or if you want to buy one for yourself to hang on to until you’re ready to use it, you still have some time left. In the meantime, have some links to pictures of gingerbread houses and a guide to finding local Christmas light displays and last year’s Festival of Lessons and Carols from King’s College, Cambridge, to amuse you during the season. If you’ve got an amateur magician in your life, Jim Macdonald has a gift suggestion over at his blog. A copy of Mark Wilson’s Complete Course In Magic, by Mark Wilson. Softcover is in print, but hardcover copies in good condition are available very inexpensively from any used-book shop — and you can get an autographed and personalized copy direct from Mark, so that’s the way I’d go. Two decks of Bicycle Rider-back poker sized cards, one red, one blue. Available from any variety store. Six American half-dollars, reasonably well-matched in appearance. Get the kind with an eagle on the back. $3.00 at any bank. That time of year is coming around again . . . the Northern Hemisphere Midwinter Holiday (exported to the Southern Hemisphere by transplanted Northern Hemisphereans), in which we celebrate, among numerous other things, the fact that the sun has come back for another year. I never fully appreciated that aspect of the season when I was a young thing growing up in Florida, or even in Texas; it took moving up to live cheek-by-jowl with the 45th parallel to show me just why so many different cultures thought that the winter solstice was a thing to celebrate. Right now, we’re in the tight and rapid end of the downward spiral, with night closing in at 4PM or even earlier, and the sense of relief when the days start getting longer again is, believe me, immediate and intense. So we celebrate our midwinter holidays with good food and good drink and the exchange of gifts, and that brings us to one of the perennial worries of the season: what to give to the other people in your life. If one of the other people in your life is a writer, I can help you with that. 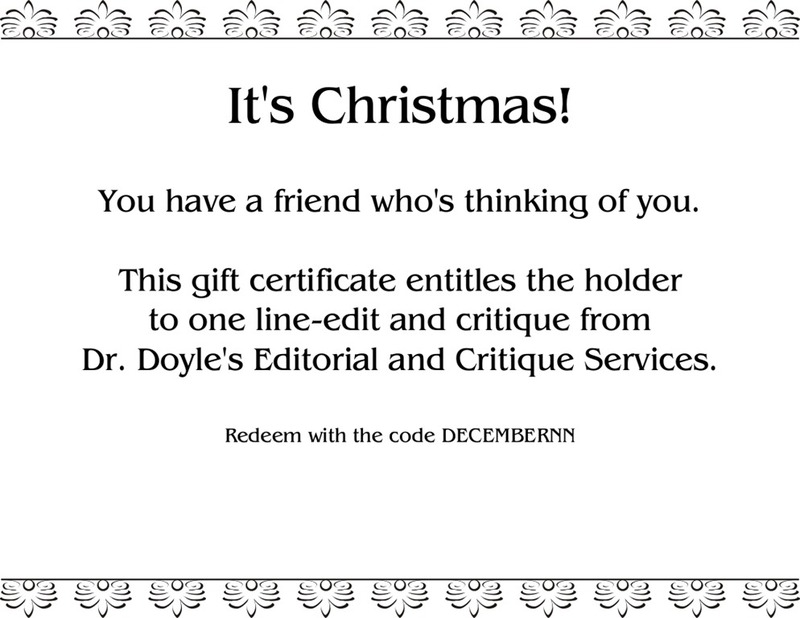 From now until the 26th of December, you can buy your writer friend the gift of a line-edit and critique from Dr. Doyle’s Editorial and Critique Services for the seasonal sale price of $1000.00, to be redeemed at the time of the recipient’s choice. The gift purchase comes with a .pdf certificate suitable for printing out and presenting to the recipient in the wrapper or envelope of your choice. The holiday in question can be customized for the recipient, as well.